Market Fresh is a concept for online grocery shopping and meal prep. The concept is Blue Apron meets Fresh Direct. Market Fresh is a full featured brick-and-mortar grocery store that is developing a delivery service. In addition to online shopping and delivery, this service should meet the needs of their target market: busy professionals who value good quality food. 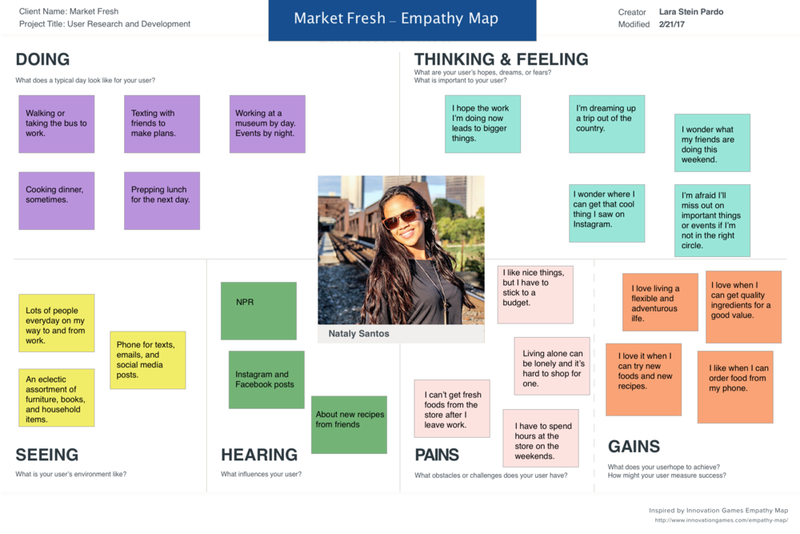 My goal with this project was to take it through the complete Design Thinking Process - Empathize, Define, Ideate, Prototype, and Test - in order to evaluate the concept of the product. 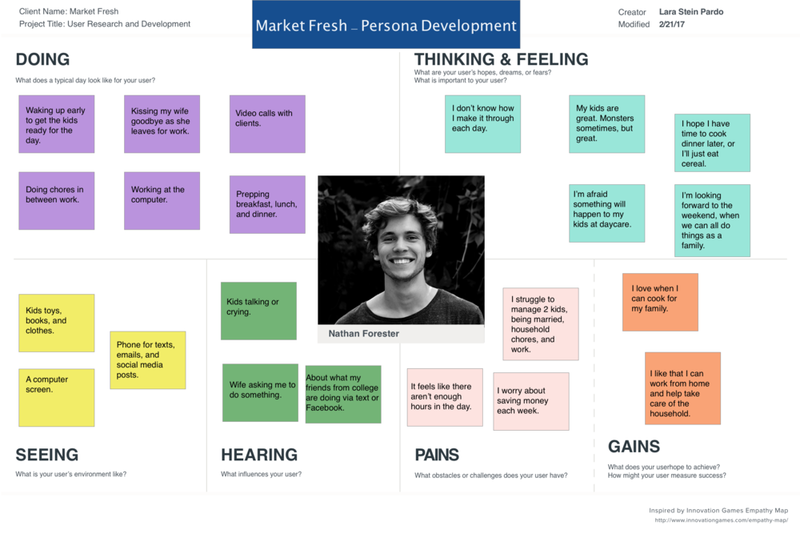 After completing the user research, I put together this chart to show the overlapping and separate goals and pains of the business and the customer. That sweet spot in the middle is where I focused my design efforts as it will meet both the business and customer needs. User stories help to define and make clear aspects of the customer's life and possible engagement with the product. It can be helpful to see small details that explain the larger decisions that are made. In this story, Nataly is working late. She'd love to cook up some seafood stew, but doesn't have all of the ingredients. It's too late to go to the store to get good seafood. So, she ends up heating up a frozen pizza and calling it a night. With Market Fresh, Nataly could have ordered fresh and quality ingredients for pickup or delivery, and she could have cooked the meal she had hoped for. The research with users showed a preference for the meal delivery kits offered by companies such as Blue Apron or Plated. However, they felt limited in their options and the users still had to go to the store to pick up essentials. In the early designs, I wanted to test the idea of recipes and how users would go about selecting and adding items to their cart. What questions would they have? Would this make sense to them as a shopping option? Where would they get stuck? I drew wireframes in pencil and paper, and then in Sketch. Once I had a solid plan for testing, I built a prototype in InVision and live-tested with users. To bring the Market Fresh concept to life, I designed a branding and visual design system. I centered my ideas on the needs of the 3 personas. What would they most like to see and feel from the Market Fresh product? The main visual metaphors centered on notions of freshness, quality, hand-crafted, and abundance. 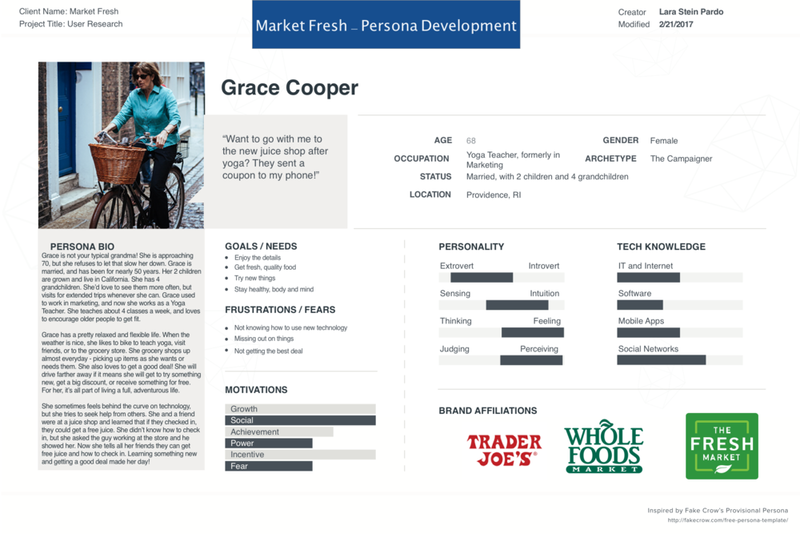 The main design task for Market Fresh is complete. I am putting the final touches on the styled mock ups, and I will add them here shortly. Overall, I learned that online grocery shopping is appealing to potential users. However, they need to feel like the experience offers something unique; above and beyond a convenience, the experience should offer fresh food and better quality than they can find in the store. Additionally, features like 'recipes,' allow users to make the most of their online shopping experience by meeting their needs of cooking quality meals quickly.